Prior to patch 4.0.3, this pet could be purchased from Magus Tirth. It is now sold by "Plucky" Johnson, a giant chicken found wandering a cliff at the southeastern edge of the zone. Hurls eggs at the enemy, dealing 669 Critter damage. Eggs continue to fall on the enemy's current pet, dealing 59 Critter damage each round for 3 rounds. P/B and S/B are the 2 breeds I would consider PVPing with. 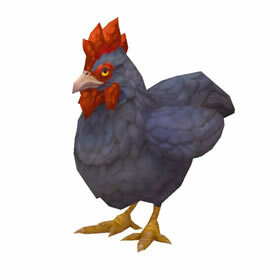 Out of the 4 pets that have egg barrage I think this is the only chicken with a P/B build. The difference between the 2 breeds is actually negligible being that it has a 50% hit chance and is only deadly if you can preprep with a team hit chance buff. I plan on choosing the S/B build for the extra little speed and testing it with Mr. Wiggles. I had bought this pet and have only leveled it to 3 so when I saw a level 14 as a secondary while looking for a rare Twilight Iguana I was very excited only to discover that it is not capturable. Looks like you must buy this pet if you want it. I was so excited to get this pet. Took me forever. Finnally used You Tube to find out how to get him. The Chicken has well rounded stats and useful abilities. But with only Squawk as means of defense don't expect it to avoid stuff or be very durable. Go for as much power as you can since no abilities get any extra benefits for going first. The Eggs can really hurt undead. And if you pair it with call lightning or a damage booster like wild magic or black claw it can really shine. As with the Yellow Moth, this pet, though purchaseable, offers a variety of breeds (4 to be exact). Considering everything, especially that flying pets enjoy a nice speed boost when over 50% health, it seems to me that the best breed for this guy would be the Breed 20 variety. Buy yourself a few of them and keep checking until you find one that features 150 health, 11 power and 10 speed at level 1 uncommon; this will translate to 1465 health, 289 power and 273 speed at 25 rare. This pet DOES occasionally show up as a secondary, but is NOT capturable. It will always be of Uncommon quality in these battles, as well. The only way to actually acquire one for yourself is to buy it. It's a chicken. A greyish chicken. Not much more to be said than that. This pet does indeed show up as a secondary to the Scorpid. Possibly from other pets too, but I haven't seen it. Also, they all appear to be uncommon quality as I have also yet to see poor, common or rare. 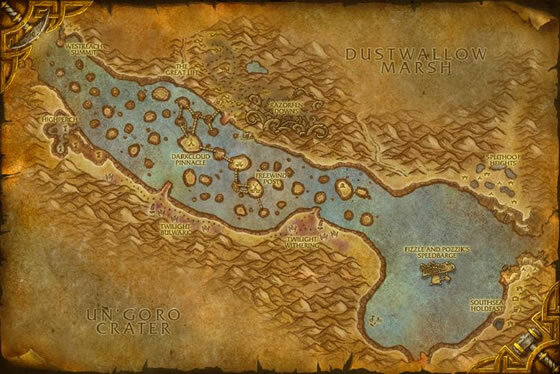 But never fear, Blizz is here! They promise in patch 5.1 for battle pets to be upgradeable in some fashion. Yayyy!! No more wasting hours on a rare search when you already have an uncommon. It shows up as a secondary combatant in Thousand Needles, but it was not capturable for me. I think you still have to buy it. It thinks you taste like chicken too.